Ten years ago, when I was still working with MapInfo, I made some maps to be displayed on kiosks at the major trailheads near Smithers. This year I got to re-make them in QGIS! So much has changed in ten years! We have piles of mountain bike trails now, and there are eleven trailheads! As well, I no longer think an air photo makes a very nice background for a map, so I set out to do something that would be easy to read and still communicate terrain. To that end I used some shaded relief (generated in Blender, of course) plus a DEM that was hypsographically tinted. I used a colour ramp imitating the one used in those fabulous Raven maps of US states: pale blue at the low end, passing through green and up to brown and white at high end. 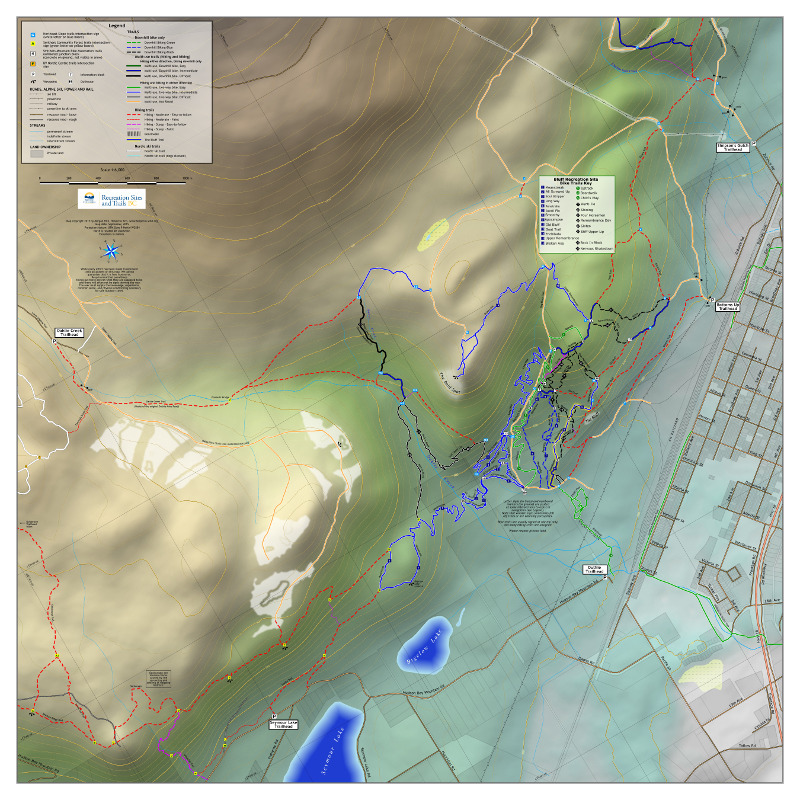 This was all composed in QGIS and finished in Inkscape. I also went for a kind of a "subway" map look, in that trails are mostly bounded lines -- suggesting that once you get on a trail you're on it to the next intersection. The bike trails are of course rated into difficulty levels, while the hiking trails have different considerations (moderate vs. steep, easy-to-follow vs. faint). One of the great things about making these maps was that I improved my trails data significantly, both through receiving GPS tracks from other people and from walking and GPSing the trails myself.